Visual: Vertical Velocity at 700 mB (10,000 feet) level over southern Africa for Friday 29 April. A gradual change in upper atmospheric conditions became visible since the previous weekend with widespread alto level clouds, supported by substantial moisture in the middle level but the combination was limited to the northern half of Namibia. The visual provides an important insight into air movement at the 700 mB level which is roughly where the cloud base (when clouds are present) would be during summer. This is the lower level that determines precipitation. It is not an indication of humidity but only of the rate of up or down air movement at a specific level. The orange areas indicate sinking air (positive value) while the blue areas show rising air (negative value). In this map the exact location of pockets of rising or sinking air is not important because it constantly changes. What is very important is that it indicates an unstable atmosphere in the levels between 10,000 and 15,000 feet ASL, which is one of the key elements of convection. 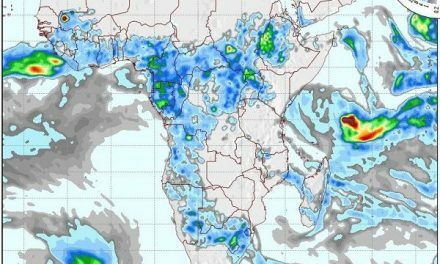 The second requirement is ample moisture and this started penetrating the middle level from western Zambia and southern Angola by Monday evening. Although scattered rainfall was reported from many areas in the northern half, the precipitation was generally less than 5mm and the showers very brief. 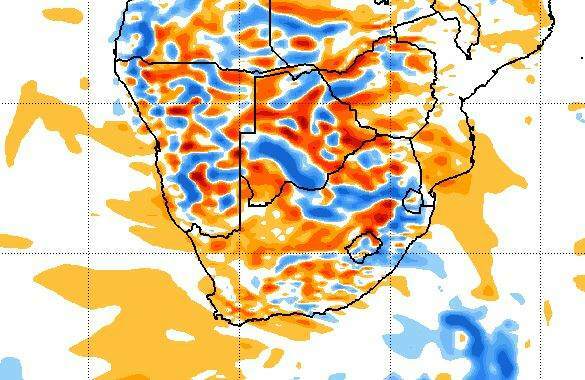 As the week progressed, the moisture penetration from the north continued, first moving west into the Kunene region, then covering almost the entire Angolan border and adjacent areas in Namibia, and by Wednesday moving south into the Namibian interior as far south as the Hardap Region. Relative humidity on the surface improved dramatically during Wednesday and Thursday and more substantial falls were reported but they remained isolated and scattered. The absence of lightening showed that conditions were not yet ideal but it was also noticeable that moisture was present in all the atmospheric strata. Where this coincided with the atmospheric instability as indicated on the visual, convection improved and so did precipitation. If the atmosphere stays unstable, there is a good chance that overall rainfall conditions for the first half of April may continue to be positive, and that this may be the case for the whole country. The intrusion of moisture from Angola is expected to continue throughout the weekend with the bias in the west due to upper level ridging from the east. This leads to the anomalous situation that the rainfall outlook for Kunene, part of Erongo, central Otjozondjupa, Khomas and Hardap, is actually better than for the Kavango and the eastern section along the Botswana border. The ridging from the east is expected to cause very hot afternoon temperatures in both Kavangos, Bwabwata and the Caprivi. On Monday and Tuesday next week, the system is expected to weaken, and pull back from the south as the next approaching South Atlantic high starts to impact surface conditions. Over the northern half, it should remain in place but again with lesser expectations in the eastern areas compared to the central interior and the north-western regions. By Wednesday, the South Atlantic high controls surface conditions with a significant fall in nighttime temperatures in Karas and Hardap. The remnant of the rainbearing system should then be restricted to the Omaheke region up to the Botswana border.